Courgette flowers are pretty difficult to get hold of, but if you can (or if you grow your own courgettes), they are delicious. In Rome, you can find white pizza (no tomato) topped with courgette flowers and mozzarella. They are a delicacy! One of my favourite treats in Rome and southern Italy is fried courgette flowers. 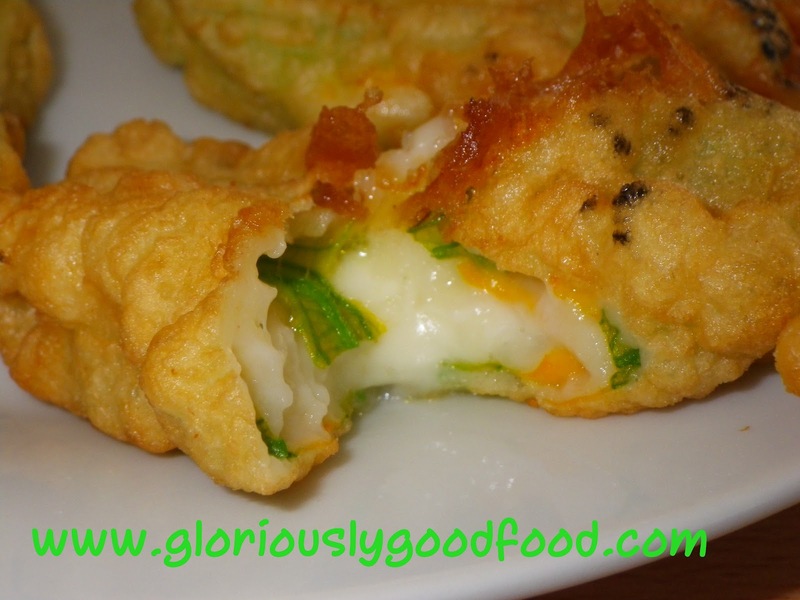 My auntie makes these with an anchovy fillet in the middle as well, and I love them! She makes them in big batches when she can get hold of the courgette flowers, then freezes them. My recipe is a very quick & simple one without anchovy fillets. Prepare a simple and fairly thick batter by placing flour in a bowl, making a well in the centre & adding beaten egg into the well. Start stirring with a fork or whisk, from the centre & moving outwards, gradually adding more flour into the egg. As the mixture starts thickening and before you’ve added all the flour, start gradually adding milk until you have a smooth thick-ish batter. Season with salt. Wash the courgette flowers and trim off any stalks or courgettes. Place a chunk of mozzarella inside each flower, dip into the batter and ensure the flower is completely coated, then deep-fry in vegetable oil or light olive oil (not extra virgin…it’s a waste for frying and too strong in flavour). They will only take about 30-60 seconds to fry, depending on the temperature of your oil. Take them out of the oil and drain on a plate with some kitchen roll on it. If you happen to have some baby courgettes, you can also dip these in the batter and fry them, but they will take a little longer to cook inside. Enjoy this very simple and very quick dish. To make about 8 fried courgette flowers will only take you approximately 10 mins from start to finish! 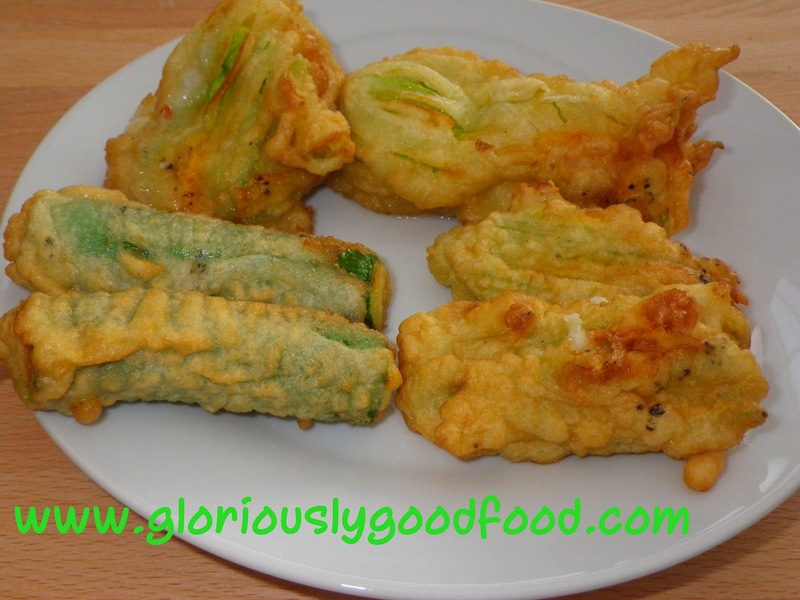 This entry was posted in Italian, Vegetables, Vegetarian and tagged baby courgettes, batter, courgette flowers, courgettes, egg, fried courgette flowers, milk, mozzarella, oil, olive oil, salt, vegetable oil. Bookmark the permalink. Hi Frederika, apart from growing them yourself. Where on earth do you get hold of courgette flowers in the UK these days. I've been wanting to play with them for ages but can never find them. Hi David. Unfortunately they are almost impossible to get hold of. I have found a few sites that sell them (just search on google) but the prices are extortionate (in the region of £45 for 12 flowers!!!). I get them from a friend of mine who grows courgettes, so it's only ever a handful once or twice in the summer months, but better than nothing. So I'm afraid the only answer I can give is to grow them yourself :(Love the look of your blog, by the way. Beautiful recipes, very elegantly presented.